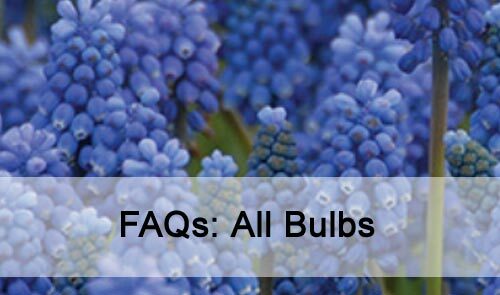 FAQs: All Bulbs This article lists frequently asked questions about bulb growing in general. After flowering is an important time for bulbs. They've just finished putting all their energy into producing a flower in the hope that it will be pollinated and set seed. That's what the flowering is all about from the plant's point of view. We don't want the plant to make seed and put energy in that direction as it results in less bulb growth. Remove old flower heads after flowering, but never remove the leaves while they are still green, the bulb needs these to provide the energy for it to grow and reach a good size for flowering the next season. Most packs of bulbs will have suggested depth and spacing information printed on them. As a general rule, plant bulbs in a hole with a depth of 3 times the height of the bulb, so daffodils, hyacinth and tulips should be planted in a hole about 12-14 cm deep and about 10-12 cm apart, smaller bulbs like muscari should be planted in a hole with a 5-6 cm depth and 5-6cm apart. What fertiliser should I use, and when? We don't recommend any fertiliser at planting time, in fact placing fertiliser in the bottom of the hole could cause the new soft roots to be burnt. Compost worked well into the soil is always beneficial for drainage and soil structure. When the shoots start to emerge, a top dressing of fertiliser will help flower growth and another light application of fertiliser after flowering will boost bulb development. Most likely because you have not registered an online account. It is a common misunderstanding that existing NZ Bulbs customers who have previously ordered by post or phone are somehow also registered for ordering on our web shop. This is not correct, a separate online registration needs to be made in the web shop by the user, where you set yourself up and choose your own user id and password during the registration process. You may be receiving email newsletters from us, but this is because we have your email address in our main database. It does not mean you are registered on the web shop. Please make a new registration in the web shop and you will be ready to start ordering. [Click here] to create a new account. If the system responds that your email address is already in use, then you do have an account and you should [click here] to have your password re-set and emailed to you. When do I plant my bulbs so they flower for my daughter's wedding? This is one of the hardest questions, because we can't really answer it. For spring bulbs, much depends on soil and air temperatures, the amount of winter cold and how warm it gets in early spring. Summer bulbs are a little easier, but the weather still plays a big part for many of them too. Can we come and buy from your nursery? We do not have a shop on site and it is not possible to come and go through our packing and processing sheds, but you can pick up your order from our office. Just specify when you order that you'd like to collect it and we will phone you when it is ready. Please check your email spam or junk folder. Order confirmations are sent automatically as soon as an order is completed online. If you have not received your confirmation then it will be in your spam or junk folder or you may have entered your email address incorrectly. If you live in a warmer area and chilled them before planting the first time, it is probably a good idea to lift them and repeat that for subsequent years. Harvest them during December/January and leave them in an airy place for some weeks. You can't start chilling too early as the developing bud is not ready for that until mid to late March. Start chilling late March and plant in late May. Only hyacinths and tulips really need chilling in warmer areas. Other bulbs should be fine. If I plant my bulbs in a pattern or a straight line will they stay in that pattern? Yes, they will stay in that general shape, but as they naturally increase in numbers over the years the sharp lines and edges will become a little fuzzier.